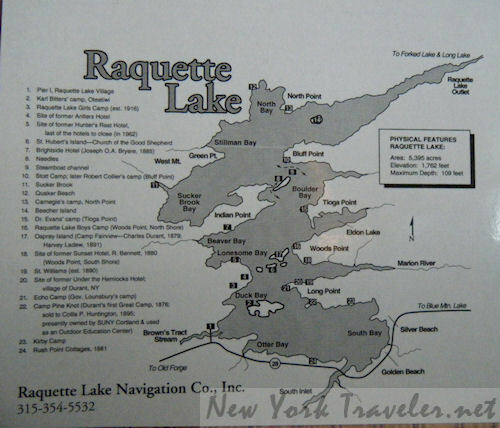 On the way home from our delightful trip to Tupper Lake in the Adirondacks, we made a pit stop at Raquette Lake. 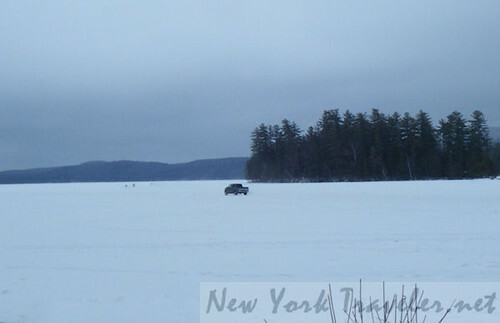 There’s a boat there in the lake– right in the ice!– that serves as a snowmobilers’ rest stop. The place was totally packed with red-cheeked, frosty-breathed snowmobilers. The boat, the W.W. Durant maintained by the Raquette Lake Navigation Company, is covered with little white lights. It’s very pretty. We went inside and had some hot dogs, and mingled with a few of the snowmobilers. 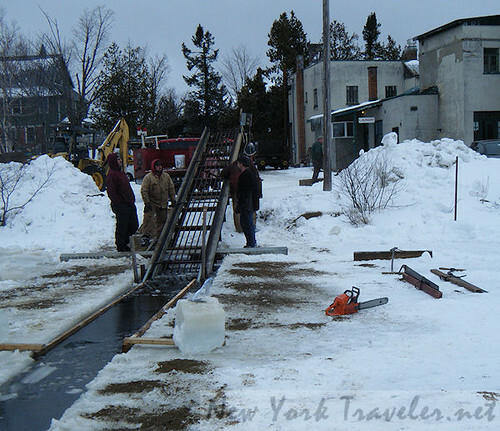 The Raquette Lake Navigation Company is a family-owned business, established in 1991. 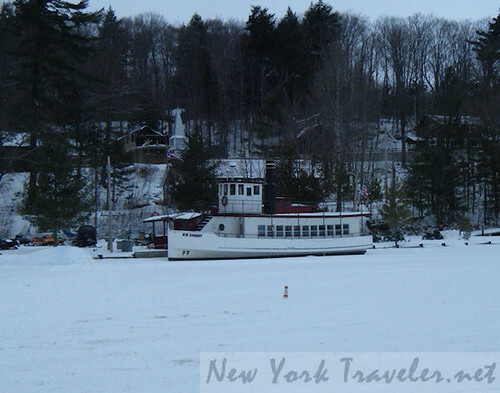 The family provides terrific Adirondack Tours– my gracious host, Donna, explained that the boat specializes in a circular Adirondack tour: to the Adirondack Museum in Blue Mountain Lake, the Camp Sagamore (built by the Vanderbilts in 1897), and around the beautiful lake. The Gilded Age Tour sounded SO good. I hope we can do this, this summer or fall. I’ll bet viewing the striking fall foliage from the deck of the Durant is amazing! 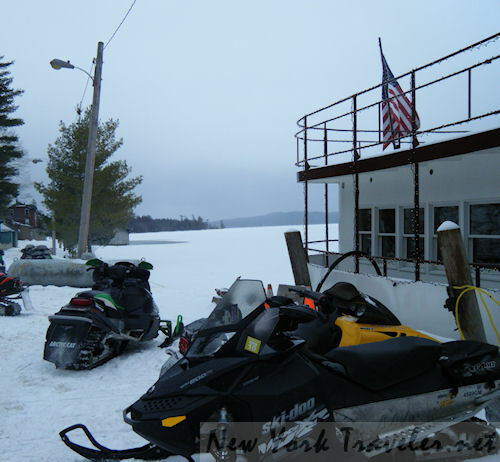 After learning about the boat tours and getting ideas for future trips, the snowmobilers encouraged us to take our car for a spin on the frozen lake! Oooo I was SO tempted! But the car I was driving wasn’t mine, it was a rental car… and if the company found out what I was doing…. ! So we walked on the lake and watched the guys roar over the ice. And then we wandered over to an ice-cutting activity. 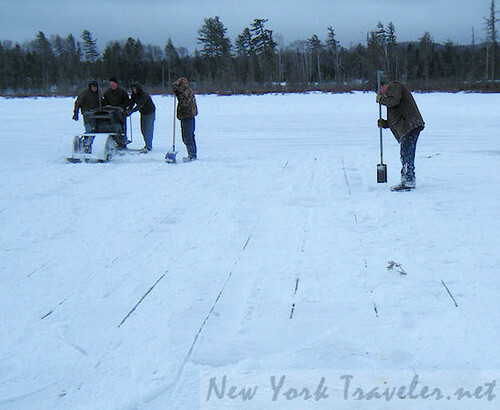 That weekend was the big ice harvest, and the workers were preparing the area for the event. It was a great experience for the kids. 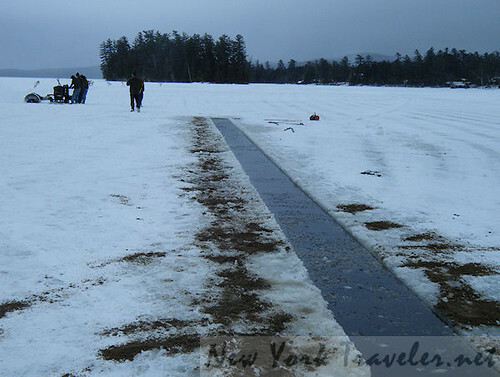 It was kind of spooky, standing on the edge of cut ice, out on a lake! But the ice was pretty thick. Donna told me that the ice is used for refrigeration during the summer. The ice is hauled up on a conveyor belt, onto a truck, and into storage. It’s kind of neat to see that the “old ways” still continue. It was like something out of a Laura Ingalls Wilder book. Except for the electric ice saw..
Our stay was all too brief. 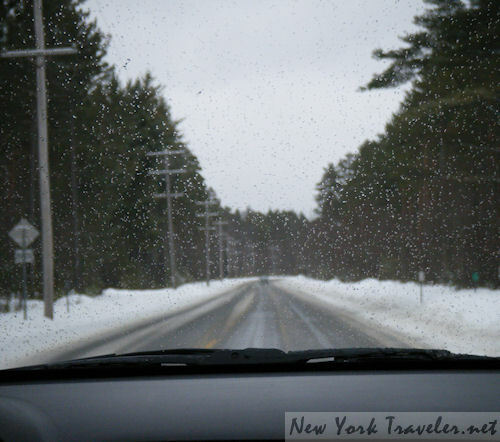 But I was anxious to get home before nightfall, and the conditions of the roads that morning made me nervous about driving. But it was smooth sailing. What a great adventure! We are learning more about this wonderful area of New York State (of which I know so little) and will be returning many times to come! For more information, see www.raquettelakenavigation.com. Loved this boat! Took the tour around Raquette Lake this past summer. Excellent, not to be missed! Very classy boat. 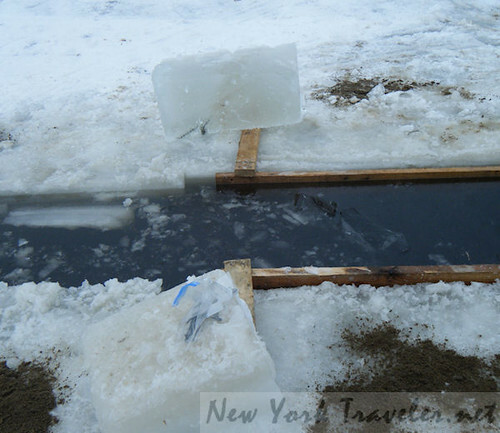 I had no idea people still did ice harvesting. Cool! Um… literally.